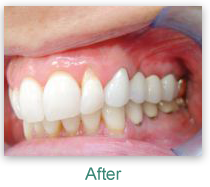 Cosmetic Dentist Sioux City IA | Smile makeovers with whitening, crowns, mini implants, bridges! Mini Implants Will Revolutionize Your Smile! Many patients who wear dentures hate dealing with them. Even the ones that are custom-fitted can slide or fall out, and they can get food trapped underneath. They also don’t help maintain healthy bone in your jaw. But we have a fantastic solution! 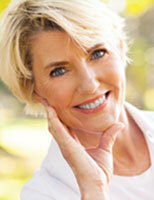 Mini implants are used to securely hold your dentures in place. A number of implants are placed into your jaw, and the dentures snap onto them. No more slipping and falling out, and no more icky adhesives! Mini implants can also be used to replace individual missing teeth. The restoration that is placed onto the implant is made of the best materials and custom shaded to match the rest of your teeth. Because it looks like it’s coming up through the gums, it is indistinguishable from your regular teeth! Mini implants can be placed immediately, all in one visit, so there’s no waiting for months to fill the gap. We highlight the aesthetic aspect in ALL our work, because Dr. Salmons believes that when your smile looks good, you feel good! He utilizes the optimum combination of preventive care, tooth-colored fillings, and restorative techniques for achieving your ideal dental health. Modern smile makeovers are so simple and budget-friendly that there’s just no reason you can’t acquire the beautiful, natural-looking smile you’ve always desired. Ask us what crowns, bonding, and whitening can do for YOUR smile! Dr. Salmons can often save a tooth that has been injured or worn to a point where a normal filling won’t bring it back to complete functionality. By installing a crown, he can rescue and even add strength to your compromised tooth. Plus, the advanced materials he utilizes to create your new crown will appear so natural, you’ll have difficulty telling it apart from an original tooth. For some patients who have a span of missing teeth, a bridge may be an appropriate fix. 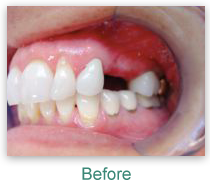 Custom made from the same high-quality materials as our crowns, a bridge is anchored on either side by a set of crowns and works to fill a void area for a return to function and comfort, as well as a full, attractive smile. Professional-strength whitening is the only way to restore your teeth to their beautiful white luster. We offer Sapphire™ in-office whitening to give you radiantly white teeth, without stains or darkness, in a single visit. Dr. Salmons is particularly proud to offer our patients a Lifetime of White Teeth! For a one-time fee, you receive custom-fitted whitening trays and bleaching gel for use at home. Then, at your twice-a-year cleaning visits, you are given complimentary bleaching gel. Now you can acquire dazzling white teeth and continue them for a lifetime! Schedule a complimentary consultation by calling (712) 239-5900, and discover how cosmetic solutions and teeth whitening can give you a brilliant new smile!